There are many types of mites that infect dogs, cats, and other animals. Mites are microscopic arthropod parasites that, for the most part, infect the skin or mucous membranes. Mites can even be present on birds and reptiles. The most common mites that infect dogs and cats are ear mites, Demodex, scabies, and Cheyletiella. 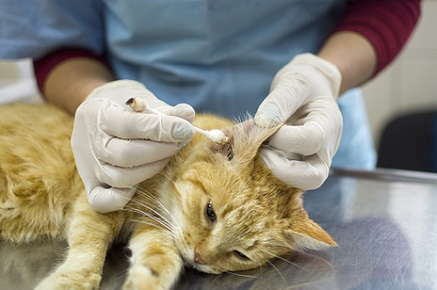 Ear mites are very common on cats and are occasionally seen on dogs. They live primarily in the ear canals and can cause severe irritation. They are easily transmitted between pets, so if they are found in one pet, all pets in contact should be treated. A different species of ear mite can infect rabbits. Demodex is a mite that all dogs are exposed to, but only a small percentage of dogs develop skin problems. In young puppies, it usually causes small areas of hair loss especially on the head and front legs. Adult dogs tend to show more generalized symptoms, and usually have more red, itchy skin lesions. Adult dogs that develop Demodex usually have another disease such as hypothyroidism, Cushings, or cancer that suppresses the immune system and allows the Demodex to increase in numbers and cause lesions. It is now recognized that cats have their own species of Demodex, but the disease is much more rare in cats. Scabies is a skin disease in dogs or people caused by the mite Sarcoptes. Most dogs with this disease are intensely itchy. Scabies is highly contagious, but not all dogs in contact are as itchy. People also have their own species of Sarcoptes; most of their cases are due to the human scabies mite, but it is possible for people to develop lesions from the dog scabies mite. Cheyletiella species of mites can be seen in rabbits and dogs. It is especially seen in puppies as large flakes of scale and is sometimes called "walking dandruff." There is no one treatment that will kill all the types of mites discussed here. Your veterinarian can advise you on the various treatments for each problem. Sign up using the form below or call 318-797-7902 to make an appointment. Thank you for taking the time to learn about us. Call us at 318-797-7902 to find out what our helpful and friendly Veterinary Team can do for you and your pet! "Love the care Dr. Loyd gives his animal patients and their families ❤️❤️❤️❤️❤️ thanks to all the wonderful staff! Pam Windham"